J.M. Browning’s 1911 pistol is 100 years old, and now the latest iteration is… a Ruger. Sturm, Ruger & Co. just introduced the Ruger SR1911 in .45 acp, Ruger’s first-ever 1911-style handgun. 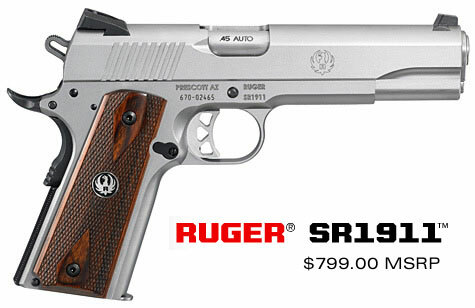 The new Ruger SR1911 pistol will debut at the NRA Annual Meeting in Pittsburg, PA, April 29 – May 1, 2011. With its bead-blasted stainless frame, contrasting grip safety, and Novak sights, Ruger’s SR1911 looks an awful lot like the Smith & Wesson 1911 with some important differences. Unlike the S&W 1911, the Ruger SR1911 has a traditional internal extractor and no forward slide serrations. The SR1911 pistol features a titanium firing pin and heavy firing pin spring. According to Ruger, “this negates the need for a firing pin block, offering an updated safety feature to the original ‘Series 70′ design without compromising trigger pull weight.” In deference to the lawyers, an inspection port allows visual confirmation of a round in the chamber. SR1911 features are shown in the DownRangeTV video below. We think the gun looks good, and will sell well. However, given Ruger’s checkered history with handgun recalls, we might wait a few months until Ruger gets the bugs out. The Ruger SR1911 weighs 39 oz., ships with one 8-round mag, and has an MSRP of $799.00. We expect street price to be around $725.00 once initial demand eases. The SR1911 is not yet approved for sale in California and Massachusetts. Share the post "Ruger Unveils New SR1911 Pistol"